The European Court of Justice has ruled that online social network sites cannot be forced to construct measures to prevent users from downloading songs illegally. The Court stated that installing general filters would infringe on the freedom to conduct business and on data privacy. The case was brought before the ECJ by Sabam, the Belgian national music royalty collecting society, against social network site Netlog. The European Parliament has passed a resolution urging Hungary to respect EU laws and values or risk having the EU assembly start a formal investigation into serious breaches of EU values, a never-before-used instrument in the EU treaty. The resolution, passed with 315 votes in favour, 263 against and 49 abstentions, spoke of the “serious concern” over democracy, the rule of law and the protection of human rights in Hungary. Despite there being hope this week that an agreement would be reached regarding the eurozone and the Greek bailout, ministers have delayed a decision. Eurogroup chief Jean-Claude Juncker said “further technical work” is needed before the ministers can sign off on the €130 billion bail-out, most likely on Monday. A report by the European Court of Auditors has found problems in the way the EU’s 31 agencies manage their budgets. The report analysed the financial management of 22 of the agencies and found that eleven of them could not properly account for half the expenses they filed in 2010. The report is likely to raise questions as to the usefulness of the agencies in times of austerity. David Cameron’s aim to ‘repatriate’ some EU social laws has been deemed as “complete non-starter” by the European Social Affairs Commissioner. Laszlo Andor took Britain to task for promulgating stereotypes, its dislike of employment legislation and the assumption that it can cherry-pick EU laws. Andor noted that EU laws which have been agreed by governments and parliament – as social laws are – are binding on all member states. If Britain wanted to be exempt from social and employment laws, the treaty would have to be changed – itself requiring the agreement of all 27 countries. German President Christian Wulff has announced his resignation, after prosecutors called for his immunity to be lifted. Mr Wulff is embroiled in a scandal over a home loan that he accepted when he was premier of Lower Saxony. Jean-Marie Le Pen, the founder of France’s far right Front National, has been convicted of contesting crimes against humanity for saying the Nazi occupation was not “particularly inhumane”. A Paris appeals court upheld the three-month suspended prison sentence and €10,000 (£8,283) fine handed to Le Pen in 2009. The French president Nicolas Sarkozy has formally launched his battle for re-election, promising to grant the public a referendum on how to get France’s growing unemployed off benefits. |He faces an uphill battle, despite his election on a huge mandate for sweeping reform in France, 70% of French people see his record as negative. Finally, Siberian authorities in Barnaul have banned a protest by toys. 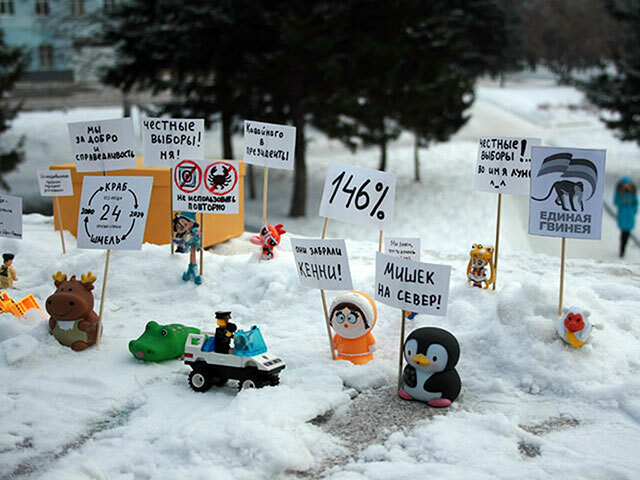 Last month saw dozens of toys standing out in the snow with banners complaining about corruption and electoral malpractice. Now a petition to hold another protest featuring 100 Kinder Surprise toys, 100 Lego people, 20 model soldiers, 15 soft toys and 10 toy cars has been rejected because the toys have been deemed not to be “citizens of Russia”. One possibility, said activist Sergei Andreev, is a solitary picket, which is allowed to take place without permission from local authorities under Russian law. “We will stand up one [toy] and the rest will sit on a bench not far away,” said Andreev. A French MP, Yves Jago, has laid down plans for Europe‘s first theme-park based on the French general and emperor Napoleon. Jago’s ideas include a Revolution experience where visitors will be “freed from the Bastille” and, while “trembling”, witness the guillotining of the king. Through French formal gardens and a 3D reconstruction of the palace of Versailles, visitors will be able to attend Napoleon’s crowning of himself as emperor.